Every Leigh dovetail jig is shipped with 8mm shank router bits. They are considerably stronger and stiffer than 1/4" shanks, allowing smoother cuts and faster feed rates with a greater margin of safety. Routers with 8mm or 1/2" collets are required to use 8mm shank bits. A Leigh 1/2" to 8mm collet reducer, supplied with most Leigh dovetail jigs, allows 8mm shank bits to be used in 1/2" collet routers. Leigh Super Jigs and the D1600 use 8º dovetail bits for through dovetail tails and one straight bit for pins. The dovetail bit's working depth (column B, Through Dovetail Bit Selection Chart below) must be equal to or slightly greater than the thickness of the pin board or drawer front. Always choose the smallest dovetail bit (column A) relative to the pin board thickness for that look of hand-cut elegance. Use the matching straight bit and template guidebush indicated in the chart. *** Bits No. 80-8, 140-8 (and 120-8) are included with each Super Jig. In half-blind joints, pins and tails are routed with the same dovetail bit at the same depth of cut. The bit angle determines the nominal depth of cut, therefore, a bit of a given angle must cut at or very near a specific depth in order to make pins and tails fit together properly. Choose a half-blind bit with a cutting depth at least 1/8" less than the pin board thickness. 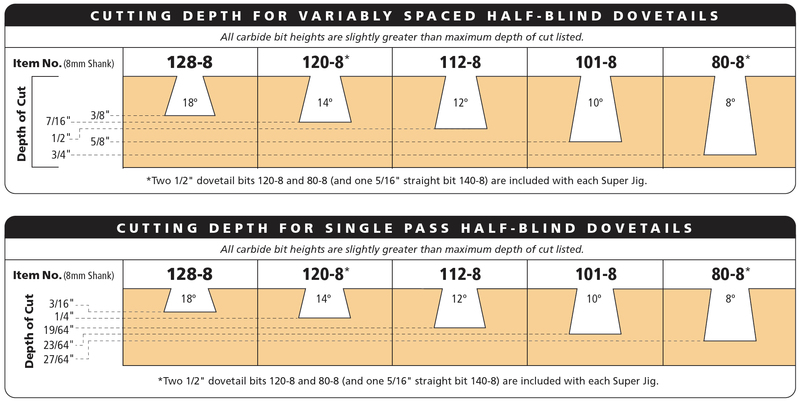 Leigh offers five half-blind bits to suit board thicknesses from 1/2" to 7/8" or greater. For rabbeted or lipped drawers, choose a bit with a cutting depth slightly less than the rabbet's shoulder depth. *** Bits No. 80-8, 120-8 (and straight bit 140-8) are included with each Super Jig. Includes Through Dovetail bits (8 degrees) 50-8(1/4"), 60-8(5/16"), 70-8(3/8"), 75-8(7/16") and Half-blind bits 101-8(10 degrees), 112-8(12 degrees), 128-8(18 degrees).